Many animation students love anime and 90s animated features because they grew up with these films and know them like the backs of their hands. But in order to advance the medium, you have to go beyond what you personally like. Is it possible to learn important techniques from films, you don’t really like? 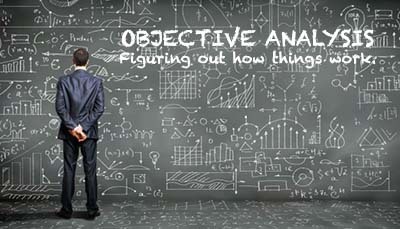 The answer is YES, but you need to learn to objectively break down your reference and mine it for techniques you can use. When Animation Resources’ Board Member JoJo Baptista was in his final year at Woodbury University working on his senior film project, he was animating a rhythmic walk for a child character. He asked me if I had any suggestions for reference to study. I immediately thought of Shirley Temple. 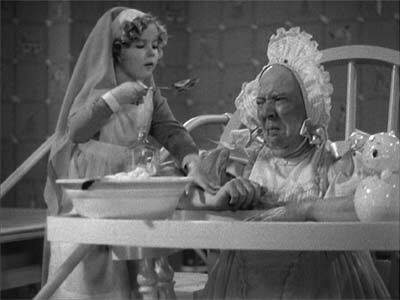 I think as you read this, you’ll get a pretty good idea of how I feel about Shirley Temple’s films. However, for an animator there is a lot to learn from them. JoJo and I broke down one sequence and analyzed it to help him animate his senior project. 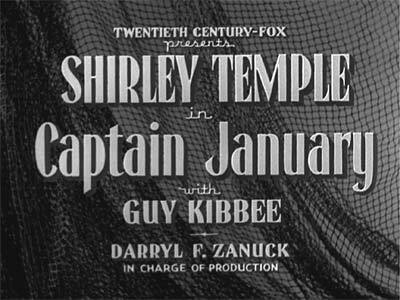 I’m going to give you a peek at the discussions that went on at the Archive regarding this film… Captain January. 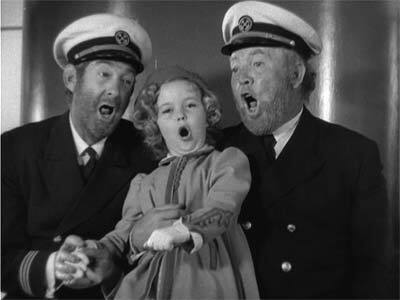 When Shirley Temple made this film in 1936, she was in the first grade. 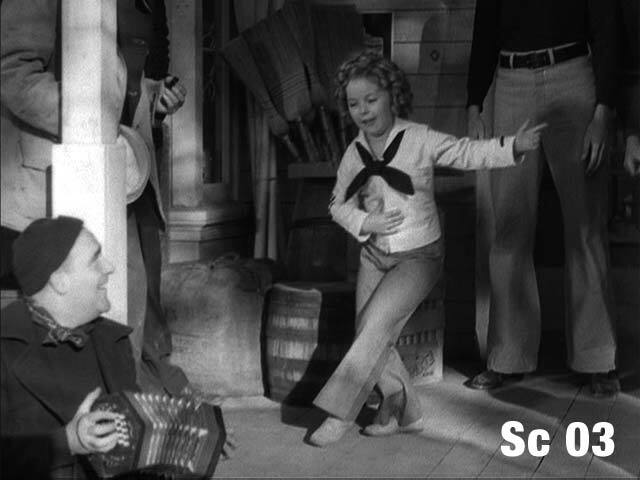 If you take a moment to view the clip below, I think you’ll agree that even at that young age, she was already a talented and skilled performer. She acts, sings, and especially dances on a level that rivals or surpasses the skills of most current pop divas, even ones with a couple of decades of experience under their belts. If you tried to think of a current seven year old who compares to her, you would have to think pretty hard. 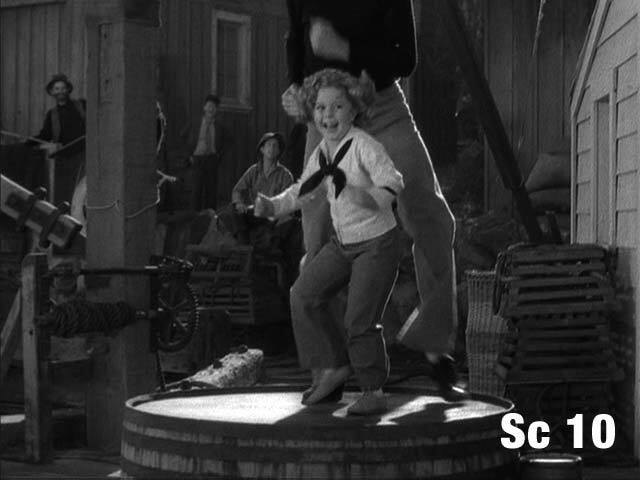 That said, I have to admit that I don’t personally care for Shirley Temple movies. 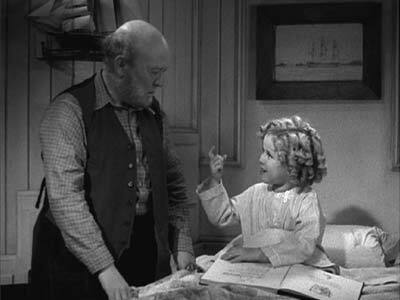 They follow a rigid formula- a lonely curmudgeon adopts an adorable orphan who melts his heart. The moppet and the old fart are separated, which creates oceans of tears, only to be joyfully reunited at the end… Although they are cute, her films really have very little to say about anything real. Perhaps some people might enjoy them as an escape, but they aren’t to my taste. There is another aspect to these films that makes me uncomfortable. 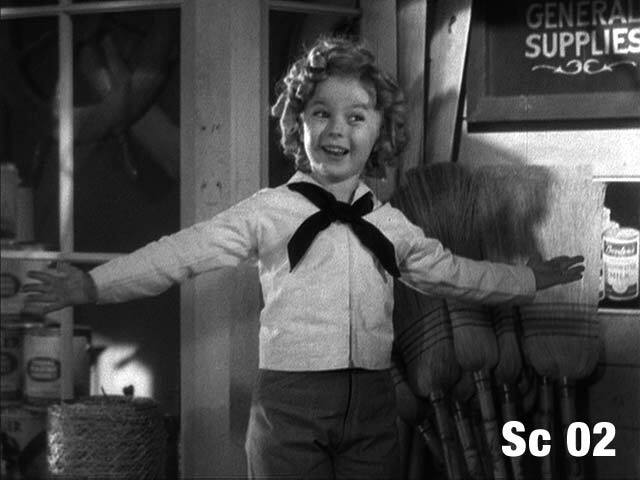 Graham Greene, writing in the magazine Night and Day wrote of Shirley Temple, "Her admirers – middle-aged men and clergymen – respond to her dubious coquetry, to the sight of her well-shaped and desirable little body, packed with enormous vitality, only because the safety curtain of story and dialogue drops between their intelligence and their desire." I don’t think I need to add anything to that quote. Maybe I’m a crusty old curmudgeon myself, but these films just don’t do it for me… Have I made it clear that I don’t care for this particular movie yet? All right. STAGING: Ebsen and Temple are surrounded in the sequence by incidental characters. Temple begins her song in a close up that isolates her from the group. 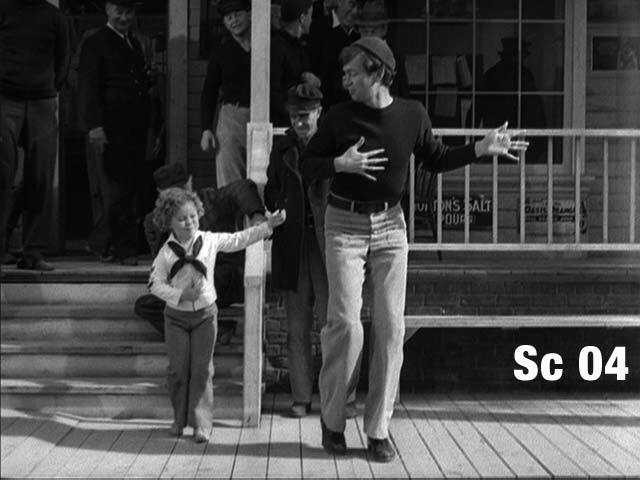 As the sequence progresses, the incidental characters recede into the background, placing the focus on the dance routine. The crowd is dressed in dark colors, while Temple wears white, making her stand out. 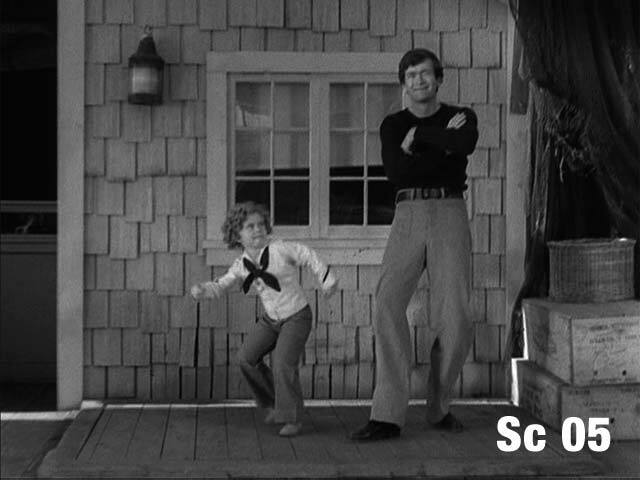 Ebsen wears a dark shirt with light pants, directing the attention to his legs, which makes sense since he is dancing. 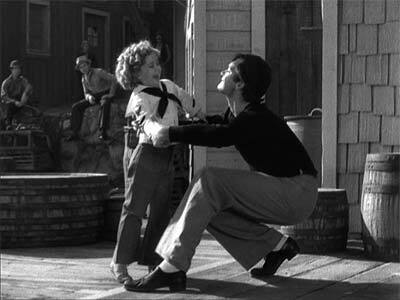 One scene at 4:02 uses Ebson’s legs to frame Temple as they dance on the wooden cask. CUTTING: The four minute sequence is broken into 11 cuts, many of which are quite long. Temple is able to sustain long takes with high energy and accuracy in her performance. The sequence is bookended by an entrance and exit through a doorway. The first half of the sequence moves from left to right. After a 180 degree jump cut at 2:16 (which works perfectly in this context) the action moves from right to left. The cuts are dictated by the staging of the dance routine, never to cut around errors in performance. Only one scene at 4:02 seems to have been performed out of continuity and inserted. The reason for this is to allow Temple to push her performance over the top for the big finish. ACTING: Temple’s ability to put across the lyrics to the song through her movements and expressions is remarkable. The scene that begins at 0:19 is packed with contrasting expressions reflecting her attitude clearly. Her gestures are always specific to the meaning of the lyrics ("from the herring to the whale") and her facial expressions never seem to be "pose to pose". If you still frame through them, they evolve through dozens of different attitudes in the space of a few short seconds. Temple’s pantomime is clear and expressive. 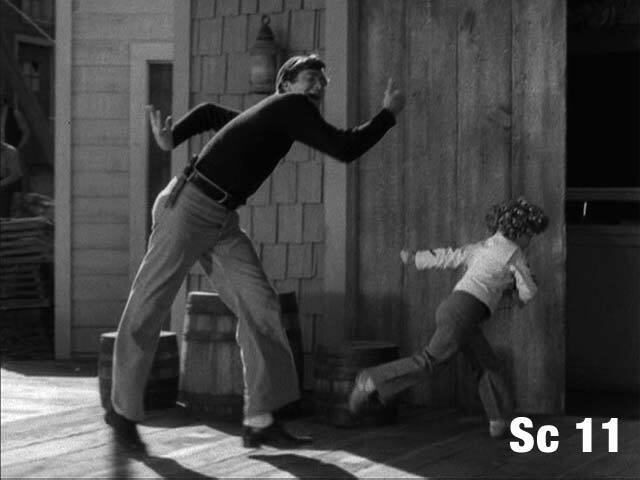 At 2:33, she throws the lead to Ebsen, studies his dance steps skeptically, does a small take of disgust and petulantly cheats by scraping her foot on the shingled wall behind her. She is always aware of the camera, and keeps her face in view, even when she is walking away from the camera (2:08) or being whisked around and around (3:41). Temple’s hair is a perfect of example of "follow through" and her dancing exhibits other principles like "secondary action" and "overlapping action" as well. There are a couple of portions of the routine where Temple’s guard falls for a few frames, or we can see her preparing for a difficult move. At 2:08 she misses her lipsync as she navigates dancing down stairs. 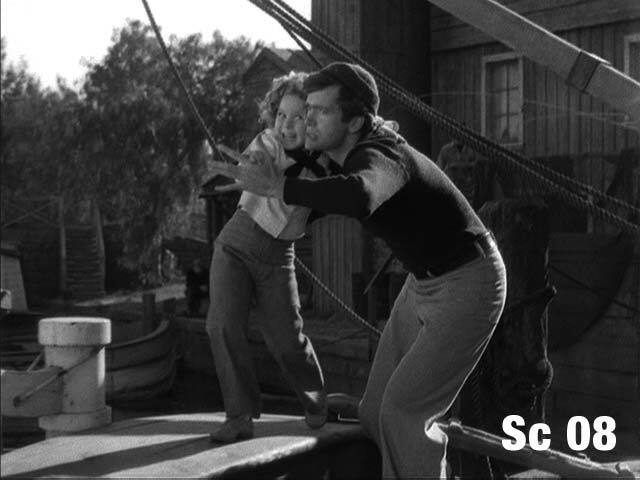 At 3:17, she scowls and looks down to Ebsen’s feet to coordinate with him as he scoops her up and trots her up the gangplank. At 3:36, she takes a beat to recover and gain her footing after a few spins. But on the next main beat, she is right back in the groove again with a glowing smile. She never falters more than an instant. Most audiences would never even notice it. 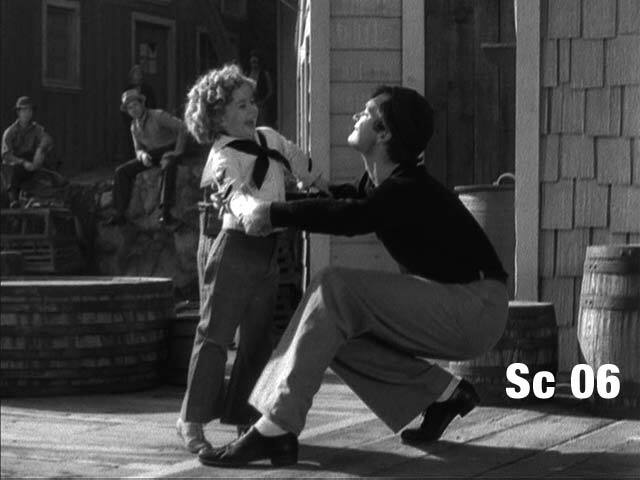 DANCING: The rhythm and synchronization between Temple and Ebsen is amazing. At 0:42, Temple struts back and forth setting her heel down on the main beat, and her toes on the back beat. She performs several different types of dance steps, including a cakewalk, a shuffle, a can-can and a truck. 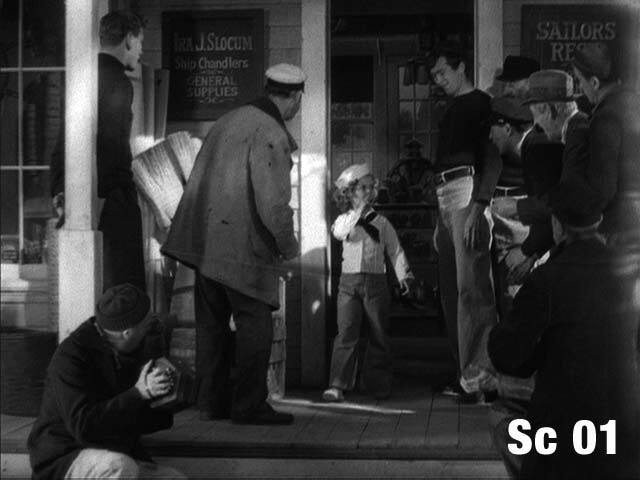 Right before the scene cut at 1:29, Ebsen hitches his pants up in the background, anticipating his entrance. Even though the two dance in perfect sync, their steps are subtly different. 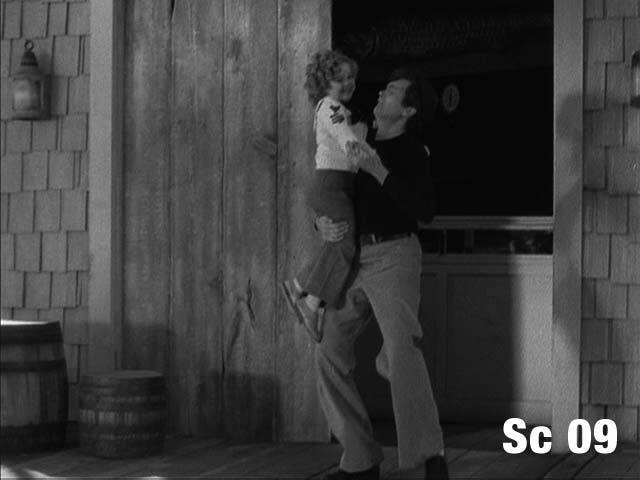 At 1:43, Ebsen dances only below the knee. Since Temple’s legs were so much shorter than his, he had to govern his movement precisely to maintain a consistent distance between them. 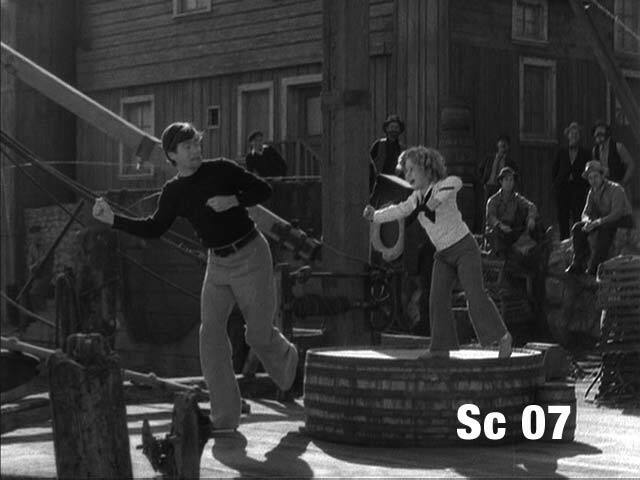 Ebsen’s gestures throughout the routine are very original and funny, particularly in spots like "to the bottom of the sea" where they flash their fingers and mimic a dive (1:42) and as they exit the scene at 4:12, where his arms flail like rubber. Ebsen is probably one of the most remarkable and under-appreciated dancers of his time. Today, most people think of him as Jed Clampett, and don’t even realize the spectacular talent he posessed. JoJo found a lot to think about and study in this film. It exhibits a level of skill and craftsmanship that today’s movies just can’t touch. Do I say that because of my personal taste? No. I don’t even like this movie. I say that because I took the time to define the criteria I judge films by and sat down and analyzed what I was looking at. There are two ways to look at a movie or cartoon… one can look at it as a member of the audience… or as a filmmaker. One of the sacrifices one makes when one chooses a career as an artist is to lose the ability to passively "experience" art. Once your mindset shifts to the analytical way a filmmaker thinks about his medium, you can never go back to the innocence of just sitting in the dark and "experiencing" a film the way ordinary people do. Oscar Wilde once wrote, "Bad artists always admire each other’s work. They call it being large-minded and free from prejudice. But a truly great artist cannot conceive of life being shown, or beauty fashioned, under any conditions other than those he has selected." The moral to this story is… The worst thing you can do is to tell old fashioned, hackneyed stories using the reduced skill levels and slack techniques of today. It’s much better to use the powerful techniques of the past to recapture a classic level of skill, and use that skill to tell honest stories that are relevant to modern audiences. This entry was posted on Monday, September 18th, 2017 at 9:56 AM	and is filed under theory.